and provide habitat for life is so declining..
That Methane, the gov wants to save money by eliminating surface measurement that is used to calibrate satellite measurement. 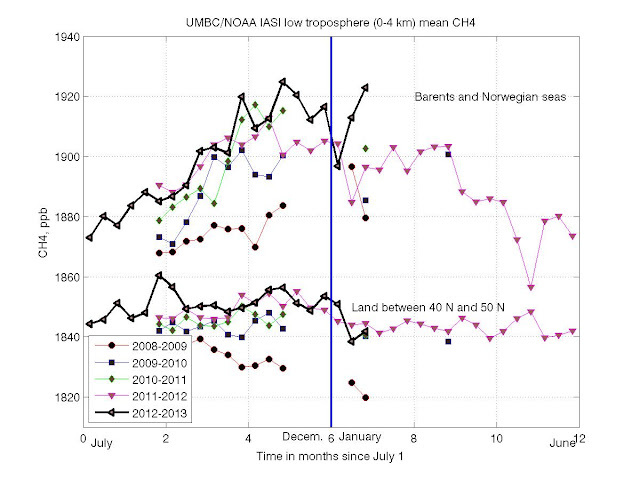 http://climatechangepsychology.blogspot.com/2013/02/noaa-monitoring-of-arctic-methane-and.html But it's not just that, it's about the disconnect between economics and Earth's commons. There is a deliberate attempt to belittle whole situation and disabling the common man to speak. Good points, Dale, a relatively small change in temperature or an earthquake can destabilize large amounts of methane held in sediments in the Arctic seabed. Years ago, Shakhova et al. considered release of up to 50 Gt of predicted amount of hydrate storage as highly possible for abrupt release at any time. As you say, there's currently some 5 Gt of methane in the atmosphere, so that would add ten times that amount, causing an amount of warming in the Arctic that would trigger even further releases. National Snow and Ice Data Center, News consistently uses evaluations based on extent of sea ice cover not volume of ice comparisons. This makes broken slush on water count same as ice 5meters thick. It hides how quick melt will likely occur come Arctic Spring and then advance.. The reason for ice not forming in Barents Sea is given as warm current of sea water coming in without mention of increased Methane levels at large. By not mentioning Arctic Sea ice volume levels and Methane increases the public is shielded from understanding what's up and coming soon but because of the urgency of the moment in which action could still happen what can be said here so our President can protect. Make a dramatic appeal to world in his State of temperature Speech coming up in about a week.. Corporations are not people, money is not speech. But our ability to think and speak will weaken soon.